All over the world, private and freight traffic will continue to increase. According to the German Federal Statistical Office, even now more than half of all people live in cities and the surrounding areas. Globalisation and urbanisation are causing these infrastructure developments. As a result, people, raw materials and goods are being moved around more than ever before. Civil engineering is confronted with increasing demands; this includes structures for transport and utility networks. Germany is a central hub for goods in Europe. Hence, it is vitally important that German canals, roads and railway tracks function well and are of high quality. Tunnels and bridges are key elements. Such projects are normally tendered internationally. For business reasons, the bidding companies must be able to use reliable and exactly definable construction machines or formwork and scaffolding systems. In reinforced concrete construction, the expense and overhead for formwork is the major factor in the working sequence of formwork, steel fixing, concreting and striking. For construction companies, material and wage costs are the most important quantities. For formwork, the relationship of these costs is usually 15 % to 85 %. Due to the tremendous competition for major projects such as tunnel construction, construction companies do everything they can to reduce wage costs. As a result, these companies subcontract both formwork machinery and equipment and all of the related engineering services. Independent of the construction method, a large number of tunnel sections are available for varying geological conditions and the planned use. The cheapest way to build any kind of tunnel structure is to use a simple rectangle. Depending on the specific situation, sometimes it is advantageous to use round, elliptical or special sections. Practical, tried and tested construction kit systems are designed to provide economic solutions for most civil engineering requirements. The secret is to use a lot of rented core and system parts for a wide range of tunnel construction applications. The Variokit engineering construction kit from Peri follows a general logic in all tunnel construction applications. This relates to its assembly logic and to the type and quantity of the required basic components. This kit is suitable for all known tunnel construction methods, such as cut-and-cover, mined, top-down and as well as various special and auxiliary construction methods. It can also be used with segment linings. Approximately 85 % of all heavy duty falsework can be created with only three core parts and a minimum of connecting and fixing elements. Thanks to its simple assembly principle, the construction kit system is very safe and quick – during both assembly and on-site use. 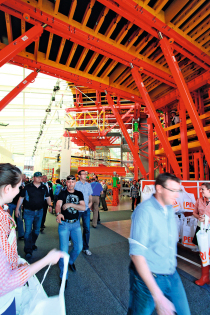 Variokit offers an additional system advantage: It can be combined with the work, protection and loadbearing scaffolding system called Peri Up. Both systems are based on the metric dimensioning system used in the building industry, with an assembly and adjustment grid of 12.5 cm, 25 cm or 50 cm. Thus, these systems are fully compatible with each other. Due to this flexibility in assembly, all types of loadbearing scaffolding can be erected. In order to minimise on-site erection times and adhere to tight construction schedules, Peri can deliver preassembled units to the construction site as required. 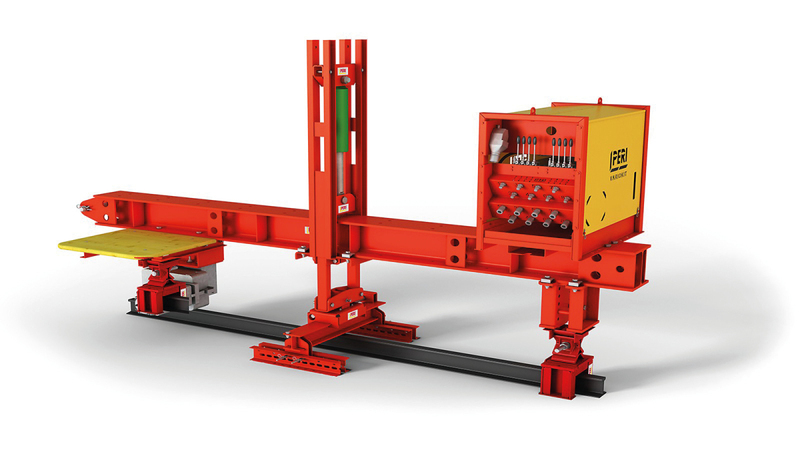 The kit is very affordable – especially for tight construction-site schedules – because many components can be rented and due to advantages of easy assembly. 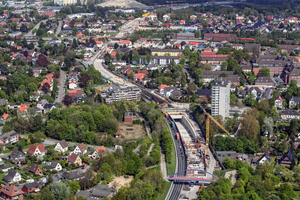 The Peri construction kit system is currently in use for harbour tunnel which is being built in Bremerhaven, Germany. 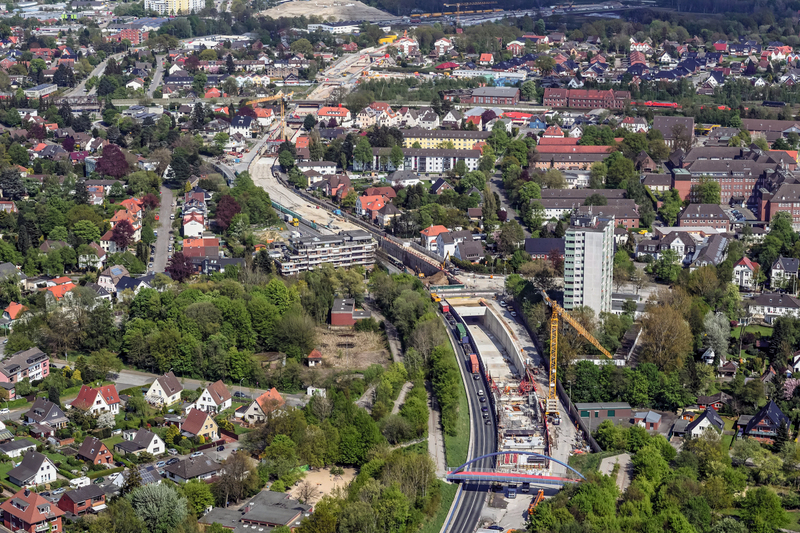 This inner-city cut-and-cover tunnel, with an overall length of 1.8 km, has been under construction since 2014. The tunnel itself is 1500 m long, and is being built inside a support structure of vertical diaphragm walls which is 15 m deep and 16 m wide. It is being built in sections in special construction docks. The chosen construction method maintains access to the neighbouring properties. Road and railroad crossings inside the construction area are not disrupted. This complex project is scheduled to be finished in 2019. 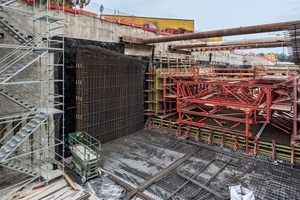 The new harbour tunnel is being constructed as a trough, in order to avoid contact with the Bremerhaven groundwater. Invert and walls are therefore constructed partially monolithically in one step. The tunnel roof is then poured. The tunnel sections are 10 m long, and are separated by means of bulkheads. Three wall and four roof formwork units are being used to build these sections. 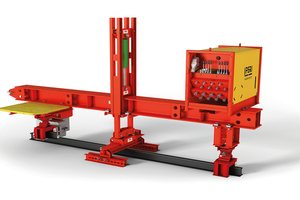 Peri’s engineers are using a leading wall formwork carriage taken from the Variokit construction kit. 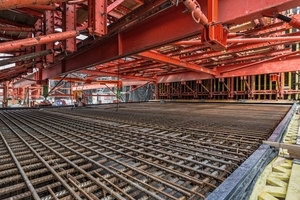 This carriage bridges over the section of the invert to be poured, supported by two traversing beams. 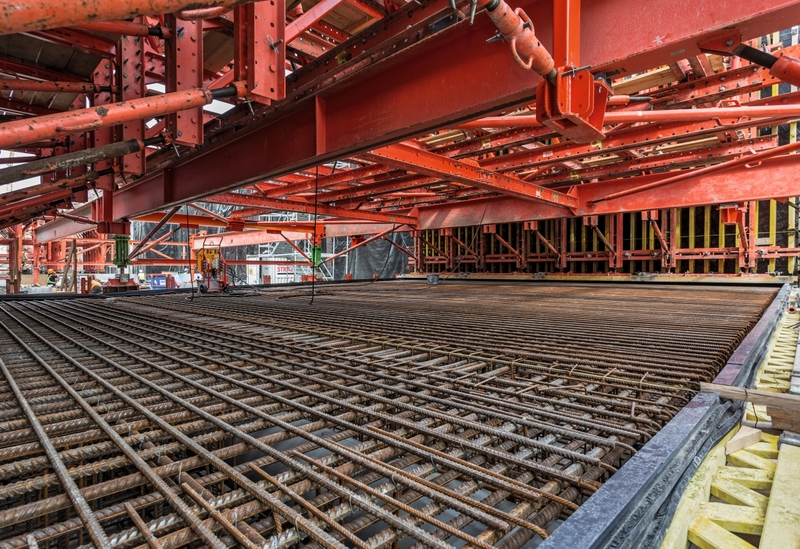 The formwork is launched, erected and struck hydraulically. 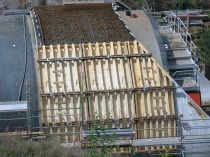 The following roof formwork carriage is mechanically erected and struck. The work proceeds in ten-day cycles. 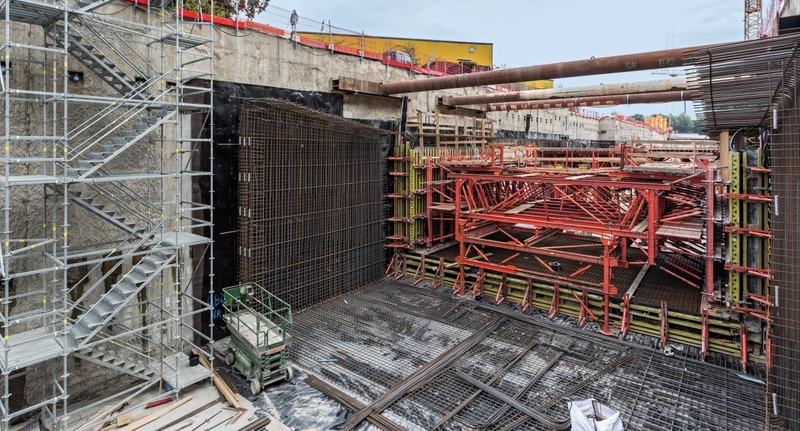 The formwork solution chosen in Bremerhaven can react flexibly to the sections and to the curves and gradients in the tunnel. This means that the formwork carriages can be used for both straight sections and for curves with radii to 500 m. The enlarged areas can also be constructed with the standard formwork carriage and adapted for each construction cycle to the varying geometry. The site is accessed by means of ten Peri Up Flex stair towers, which ensure safe and simple access to the bottom of each excavation. These stair towers are built such that a crane can move them to the next section, without erecting, dismantling or adapting anything. The harbour tunnel being built in Bremerhaven illustrates how flexible Peri’s civil engineering systems are. Tunnel and bridge formwork carriages are normally individual, project-specific solutions. The Variokit civil engineering kit can also be used to create affordable standardised system components. In this connection, the consistent support of the in-house engineering department is important. In Bremerhaven, a Peri project coordinator looked after detail questions and material deliveries as the interface between the site management and the responsible Peri engineers. In addition, an experienced master scaffolder from Peri provided assistance with the first assembly of the formwork carriage units. In combination with a dense network of local offices, warehouses and specialist consultants, Peri Engineering supports construction companies with their projects thoroughly with extensive design services, in order to achieve the best possible use of the Variokit construction kit in construction operations.